Device groupings allow users to easily manage and locate a collection of devices. Devices can belong to only one group. Groups can be nested in a hierarchy tree. This article provides the instructions to add, edit, and manage your device groups within Devices. Click the New button, and enter in the name for the new device group. 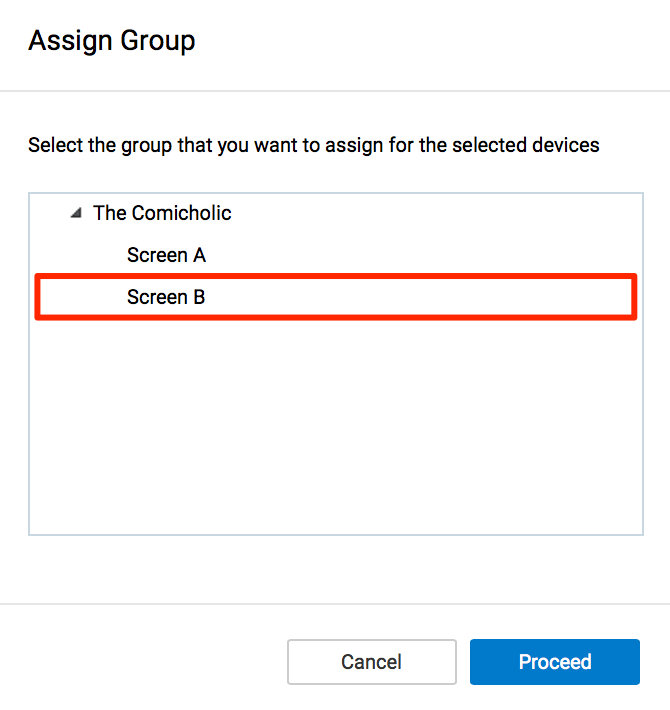 Subdevice groups can be created by selecting an existing device group, and clicking the New button. Navigate to the device group where the selected device(s) are located, or use the Search field to locate the device(s). Please ensure the selected device(s) have been assigned with a channel prior to being moved. Device(s) cannot be moved, if they are not assigned to any channel. Select the device(s), and click the Move button. In the Assign Group window, select the desired device group, and click Proceed. Verify the selected device have been associated and grouped under the desired device group in the main device listings page. Select the desired device group to rename, and click the Edit button. Rename the device group name, and press Enter to confirm edits. Select the desired device group to delete, and click the Delete button. Devices within the deleted group will be returned to Ungrouped Devices. Select Ungrouped Devices to view all devices that have not been assigned to a device group.